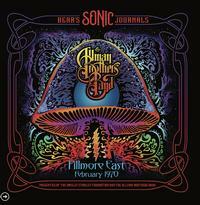 Bear's Sonic Journals: Allman Brothers Band, Fillmore East February 1970 presents restored and mastered recordings of the Allman Brothers Band at the Fillmore East on February 11, 13 & 14, 1970, captured by legendary Grateful Dead soundman, Owsley Stanley, a/k/a Bear, who is known for the purity of his "Sonic Journal" recordings and their uncanny ability to place the listener in the venue. The album includes material from three incredible performances early in the Allman Brothers' career and the digital downloads provide exclusive access to all of the source tapes for the album. Click here to purchase the complete three night performances! This is essential listening for Allman Brothers Band fans, showcasing an early incarnation of the band with Duane Allman in full form and featuring the earliest known live concert recording of “In Memory of Elizabeth Reed,” which had just been penned by Dickey Betts shortly before these shows. The tapes were recorded just one year before the band’s landmark At Fillmore East album from the same venue. Long out-of-print, this set was freshly restored and mastered from original tapes in Owsley Stanley's archives, and includes all new album art and liner notes, including a series of rare band photos from the Fillmore East in February 1970, original cover artwork ("Electric Mushroom"), and new notes from the Allman Brothers Band and the Owsley Stanley Foundation. This is the second release in the award-winning "Bear's Sonic Journals" series and the first joint presentation by the Allman Brothers Band and the Owsley Stanley Foundation. The tapes were recorded just one year before the band’s landmark At Fillmore East album from the same venue. Long out-of-print, this set was freshly restored and mastered from the original tapes captured by legendary Grateful Dead soundman, Owsley Stanley, a/k/a Bear, who is known for the purity of his "Sonic Journal" recordings. All of the source tapes for the CD release have been transferred and mastered for release as high-resolution FLAC files, which include never before released material from each performance. The CD release features all new album art and liner notes, including a series of rare band photos from the Fillmore East in February 1970, original cover artwork ("Electric Mushroom"), and new notes from John Lynskey (Hittin The Note – Fanzine editor in chief) and the Owsley Stanley Foundation. This is the second release in the award-winning "Bear's Sonic Journals" series and the first joint presentation by the Allman Brothers Band and the Owsley Stanley Foundation. The foundation’s first release, Doc and Merle Watson: Never the Same Way Once, was named Stereophile Recording of the Month for October 2017. These tapes were restored and transferred to the most exacting audiophile standards, utilizing state-of-the-art Plangent Processes techniques to remove subtle timing distortions created by the recording and playback devices. The mastering was done by Jeffrey Norman (Mockingbird Mastering), long-time collaborator with the Grateful Dead and Owsley Stanley. The Owsley Stanley Foundation is a 501c(3) dedicated to the preservation of “Bear’s Sonic Journals,” Owsley’s archive of more than 1,300 live concert soundboard recordings from the 1960s and 1970s, including recordings by Miles Davis, Johnny Cash, The Grateful Dead, Jefferson Airplane, Fleetwood Mac, Janis Joplin, and more than 80 other artists across nearly every musical idiom. All proceeds to the Foundation from the development of the recordings further the continuing charitable purpose of preserving Bear’s Sonic Journals and perpetuating Owsley's legacy.